Every year GTS rolls around and Livingdice faces a brutal task. We choose the one game that stands above all others, the “GTS 2011 Best of Show.” We do our level best to give every game an equal shot, regardless of company size or marketing budget. Earlier winners include the groundbreaking, but sadly unsuccessful “Ex-Illis” software/miniature game hybrid and the “Yu-Gi-Oh 5D” in store arcade kiosks that combined both standard CCG mechanics and a fun digital interface. This year’s winner is a low-tech board game, but with a great theme, fun mechanics and a serious challenge factor. Let me talk a bit about the game play itself and then move on to some of the finer points. Stuart and I got in a nearly complete game, save for a ship combat mechanic that was not ready just yet (the Clix bases were non-functional on the ships). Here is a shot of the board. The “Enterprise” image at the top is the central transit site for transporter movement. Players may beam up once during their turn and then beam down to any place on the planet (the cards with tokens on them). Alternatively, players move one space for each action expended. Players get a random number of actions for each round based on the event card draw (these cards are under the hand on the image’s left side.) Besides actions, there are events on the cards that resolve immediately if applicable. The top of the board has the ship combat tracking path. Various events and actions move the ships and bad things happen if the Klingons advance too far. The track at the right is the turn tracker. Some events take place after a certain point on the track, so moving faster is better. During a turn players may exchange items, beam up/down, pick-up items (the square tokens on the board), attempt to complete a challenge (visible on the board as the cards with red, blue or gold numbers), draw cards or use a special ability. I played “Uhura,” so my special ability was drawing a card and then giving to a nearby player in one action. The main resolution mechanic are the various challenges on the board. In the image there is a “24” command challenge at the center (its gold, blue for science, etc) that I will use as an example. To beat the challenge, one or more players enter the square, add whatever bonuses from cards or crewmen (red-shirts that give bonuses for various actions) and their own skill to a dice roll. All the characters have comparative advantage in the various skills. While everyone has the same skills, if you want to beat a command challenge, send James Tiberius Kirk. Need something analyzed? Send Spock. That said, given a little luck and the right combination of bonuses anyone can defeat a challenge. Our Captain Kirk player successfully cured a plague, so anything is possible. Players do take damage from cards or challenges. You cannot die, but as you take damage the Clix base reduces your skill numbers until you finally drop and retreat to the Enterprise for some Dr. McCoy quality time. The challenges often have two levels of success. You can get by with a 20 dice roll, but a 24 gets you better results. Specifically, there is a chart (just visible at the top of the board and to the right) that tracks success. The low success gets you one point on a track, while the higher gets three. This is something of an issue because organizing challenge attempts takes time and some time just getting it done is more important than the larger point benefit. The lesser success also changes how you draw event cards for the various tracks. A low success on a “command” challenge might mean that the command plot line (deck) increases in difficulty or the rewards go down. Choose wisely. The success tracker also indicates how you did at the end of the game. To win, you must move all three tracks as high and as fast as possible. You could focus on only one track, say the Klingons and defeat them, but the planet descends into anarchy because the rebels won. If you have not already guessed, this is a cooperative game, so team work is essential to success. Ego by players will result in defeat. The mechanics are fun and the game quite fast (under one hour). The cards, board and Clix miniatures all were of good quality. Most importantly for me though was the “feel” of the game. The Wizkids! representative indicated that Reiner wanted the game to play like an episode. I thought he was just trying to sell us on the game, bu it actually is true. As you play the game, you almost have “acts” like a TV show. Things start going well and then BAM!, the plasmatic ferangulator device fails and you need to find some dilithium crystals or you are all going to die! I truly enjoyed Star Trek: Expeditions, but I have a reservation. The plot lines and events required to make the game “episodic” might limit the re-playability of each scenario. Yes, the cards and tokens appear randomly on the board, but after 4-5 runs of the same scenario the excitement level might run dry since repeated players know the best path to completion. That said, this game begs for add-ons and supplements and I expect them in the near future. These are my thoughts on Star Trek: Expeditions and my reasons for giving it the “GTS 2011 Best of Show” title. Stuart chiming in here. I had the same reservation as Trask. The game is GREAT, but it will need to be supplemented with additional stories to use to increase re-playability. I also hope for an expansion to bring in more of the Star Trek personnel as Kirk, Spoke, Uhura, and Bones were the only player options. We need Sulu, Chekov, and of course, Scotty! 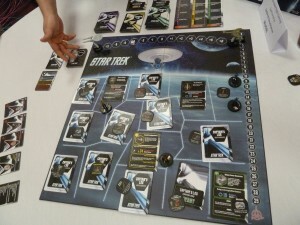 But this game was a fun game, especially for Trekkers and as it was designed by Reiner Knizia, you won’t go wrong. You can play the game solo, or up to four players. It has a run time of about an hour. and it is set to release in mid-June. Good pick, guys! This was my hit of the show, as well, with Ascension (which I had not played before) coming in second. Gen Con For Sale? A Purchase Offer is Pending!